FINE. 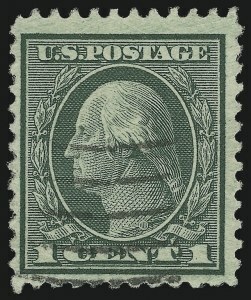 ONE OF THE FEW EXTANT MINT NEVER-HINGED EXAMPLES OF THIS MAJOR 20TH CENTURY RARITY. PROBABLY NO MORE THAN 20 OF THE 1922 ONE-CENT ROTARY PERF 11, SCOTT 544, EXIST IN ANY UNUSED STATE -- FEWER THAN TEN ARE MINT NEVER-HINGED. 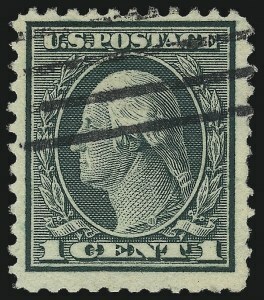 A small quantity of 1c Rotary Press stamps was perforated 11 at the end of 1922, using remainder sheets from the earlier printings that were normally perforated in 10 gauge or 10/11 compound gauge. 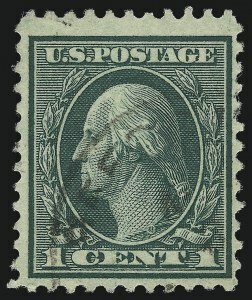 Its existence as a Perf 11 variety was discovered in 1936, and the stamp received its Scott Catalogue listing in 1938. 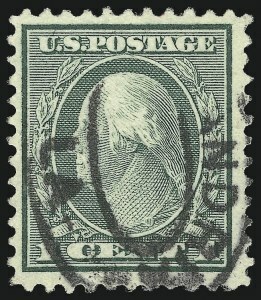 Most of the recorded copies of Scott 544 are off-center or have been damaged -- the result of poor production standards and mis-handling. VERY FINE AND CHOICE. A BEAUTIFUL SOUND EXAMPLE OF THE RARE 1922 ONE-CENT ROTARY PERF 11, SCOTT 544. VERY FINE. 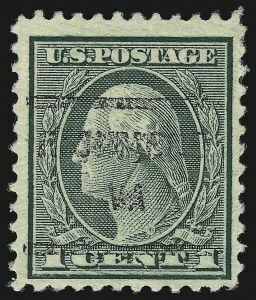 A CHOICE LIGHTLY-CANCELLED EXAMPLE OF THE 1922 ONE-CENT ROTARY PERF 11, SCOTT 544. 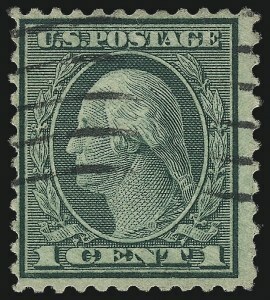 VERY FINE AND CHOICE EXAMPLE OF THIS RARITY WITH A POSTAL CANCEL. VERY FINE AND CHOICE. 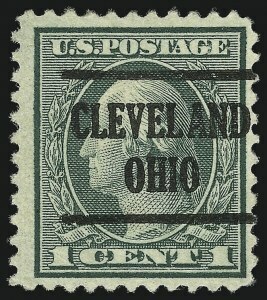 A LOVELY POSTALLY-CANCELLED EXAMPLE OF THIS MAJOR 20TH CENTURY RARITY. 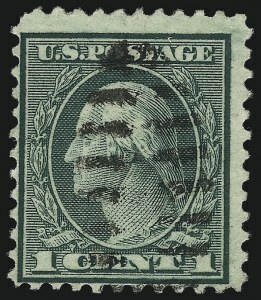 VERY FINE AND CHOICE EXAMPLE OF THIS RARE ROTARY SHEET WASTE ISSUE. VERY FINE AND CHOICE. 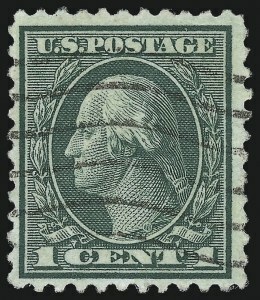 THE 1922 ONE-CENT ROTARY PERF 11 IS RARELY FOUND IN SOUND CONDITION WITH MARGINS OF THIS WIDTH. VERY FINE AND CHOICE APPERANCE. 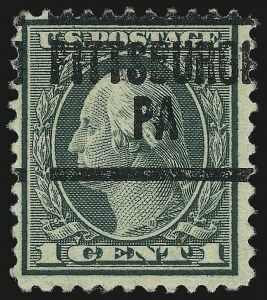 AN ATTRACTIVE WIDE-MARGINED EXAMPLE OF THIS 20TH CENTURY RARITY WITH A POSTAL CANCEL. VERY FINE APPEARING EXAMPLE OF THE RARE 1922 ONE-CENT ROTARY PERF 11, SCOTT 544. VERY FINE APPEARANCE. 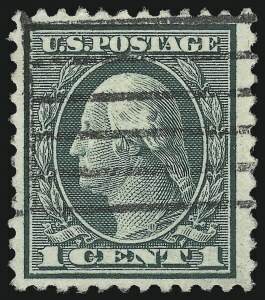 AN ATTRACTIVE WIDE MARGINED EXAMPLE OF THIS POPULAR 20TH CENTURY RARITY. VERY FINE AND CHOICE VERTICAL PAIR OF SCOTT 544. 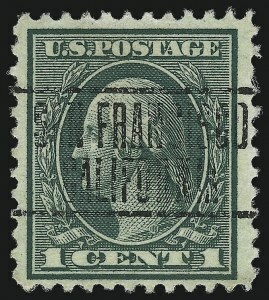 The largest known multiple of this stamp is a vertical strip of four on cover. Other than that, there are only a few pairs known. This pair is in especially outstanding condition. FRESH AND FINE EXAMPLE OF THIS RARE ROTARY SHEET WASTE ISSUE. FRESH AND VERY FINE EXAMPLE OF THIS CHALLENGING ROTARY SHEET WASTE ISSUE. 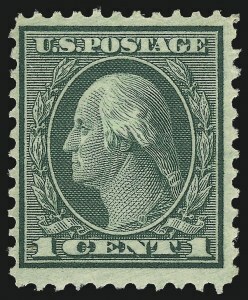 VERY FINE EXAMPLE OF THIS 20TH CENTURY RARITY. DIFFICULT TO FIND SOUND AND CENTERED. VERY FINE. 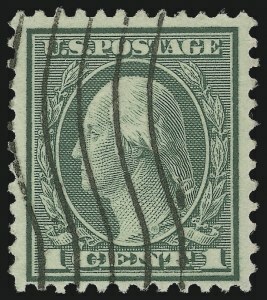 A FRESH AND CHOICE EXAMPLE OF THE ONE-CENT PERF 11 ROTARY WASTE ISSUE, SCOTT 544. VERY FINE. AN OUTSTANDING EXAMPLE OF THIS RARE ROTARY SHEET WASTE ISSUE. 1c Green, Rotary Perf 11 (544). 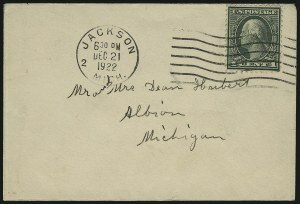 Choice centering, tied by "Jackson Mich. 6:30PM Dec. 21, 1922" machine cancel on small cover to Albion Mich. EXTREMELY FINE. A BEAUTIFUL EXAMPLE OF THE 1922 ONE-CENT ROTARY PERF 11 ON COVER. ONLY NINE POSTCARDS AND FIVE COVERS HAVE BEEN CERTIFIED AS GENUINE BY THE PHILATELIC FOUNDATION. 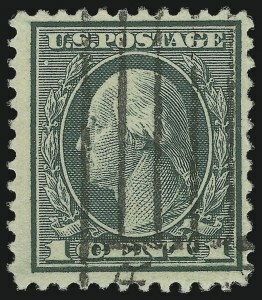 A small quantity of 1c Rotary Press stamps was perforated 11 at the end of 1922, using remainder sheets from the earlier printings that were normally perforated in 10 gauge or 10/11 compound gauge. 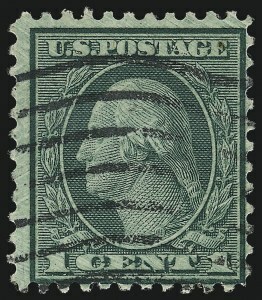 Its existence as a Perf 11 variety was discovered in 1936, and the stamp received its Scott Catalogue listing in 1938. Until the 2011 edition, the Scott Catalogue listed this cover as the earliest documented usage. 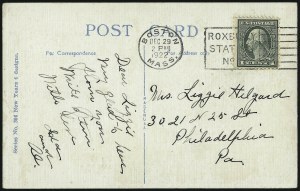 The new edition lists the EDU as Dec. 17, 1922 based on a postcard expertized by APEX. 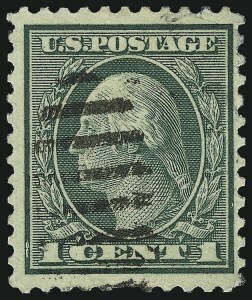 This remains the earliest known use on a full cover. In addition to the 14 examples expertized by the P.F. there are a handful of others which have received A.P.S. certificates. VERY FINE. 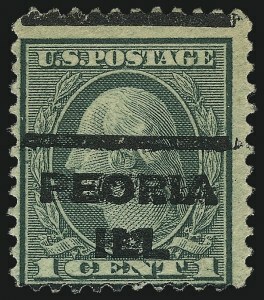 AN EXCEEDINGLY RARE EXAMPLE OF THE 1922 ONE-CENT ROTARY PERF 11 USED ON A POSTCARD. ONLY NINE POSTCARDS AND FIVE COVERS HAVE BEEN CERTIFIED AS GENUINE BY THE PHILATELIC FOUNDATION. A WONDERFUL EXHIBITION ITEM. The beautiful design side of the postcard reads "A new year wish. May you have good luck and always be in clover." In addition to the 14 examples expertized by the P.F. there are a handful of others which have received A.P.S. certificates. 1c Green, Rotary Perf 11 (544). 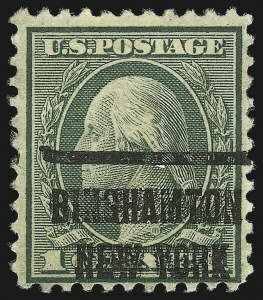 Rich color, tied by "Belmont Vt. (Month?) 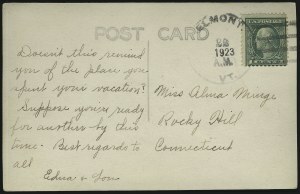 22 A.M. 1923" duplex datestamp and bars cancel on photographic postcard to Rocky Hill Conn. VERY FINE. 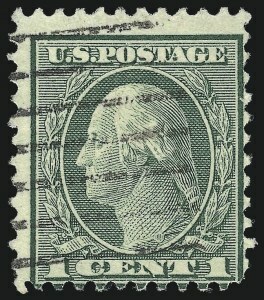 A RARE EXAMPLE OF THE 1922 ONE-CENT ROTARY PERF 11 USED ON A POST CARD. ONLY NINE POSTCARDS AND FIVE COVERS HAVE BEEN CERTIFIED AS GENUINE BY THE PHILATELIC FOUNDATION. In addition to the 14 examples expertized by the P.F. there are a handful of others which have received A.P.S. certificates. Most of postcards we have offered do not have a year date.